Paul Jorgensen chases after the ball during the Northern Illinois game. Jorgensen contributed 16 points, three assists and three rebounds in the win. Photo by Jimmy Lafakis. 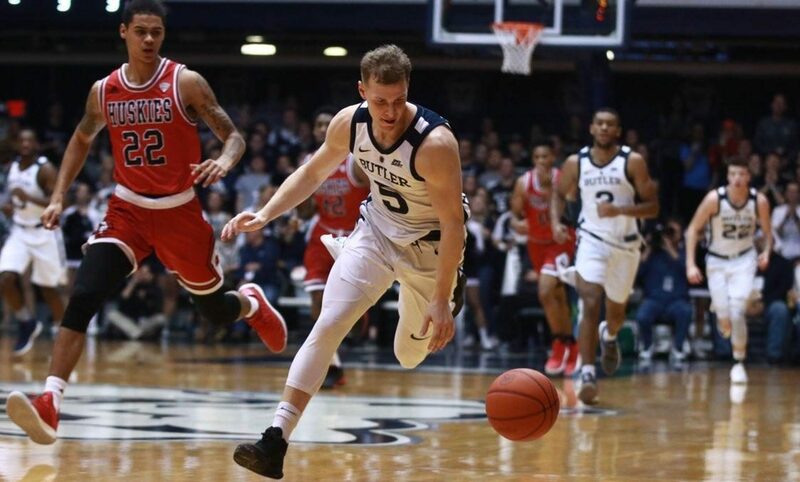 The Butler men’s basketball team put on an offensive masterpiece against Northern Illinois, cruising to a 95-68 win. Butler went on 13-2 and 14-2 runs in the first half, building a lead that ballooned to as much as 34. Here are three takeaways from a mesmerizing performance. 1. Butler’s could do no wrong on offense. What the Bulldogs did in the first half was absolutely ridiculous. Thirteen minutes in, they already had 41 points. Butler took 17 3-pointers and made 11 of them. The team’s assist-to-turnover ratio was 7.5, nearly unheard of for an individual player, let alone a full roster. The Bulldogs shot 68 percent from the field and assisted on 15 of their 19 made field goals. They also held the Huskies to 28 points while scoring 51 of their own. Realistically speaking, the first half could not have gone any better for Butler. The Bulldogs cooled down slightly in the second half but still added another 44 points and shot 54 percent from the field. Of Butler’s 34 field goals in the game, a remarkable 79 percent of them came off of assists. Part of the reason the Bulldogs shot the ball so well was that their ball movement created excellent look after excellent look. When everyone is bought in and sharing the ball, an infectious energy is created, which is exactly what happened to Butler in this game. 2. Don’t let Aaron Thompson go unnoticed in all this. Thompson played 16 minutes in the first half. He made the only shot he took, finishing the period with a mere two points. And he was arguably Butler’s most valuable player during the 51-point outburst. Thompson went into halftime with seven assists and zero turnovers. He finished with nine and one, respectively. When he is playing well and avoiding foul trouble, Butler is a vastly improved team. The Bulldogs don’t operate nearly as smoothly on either end of the floor without him. It’s impossible to quantify the impact Thompson has on this team. Thompson’s defensive contribution must be acknowledged as well. Eugene German came in averaging 22 points and three 3-pointers per game. With Thompson guarding him most of the time, he managed only seven points and one 3-pointer in the first half. The wonderful thing about a player like Thompson is that he makes everyone else on the floor better and doesn’t need to dominate the ball to do so. He can score four points in a game, as he did against Northern Illinois, and be one of the best players on the court. 3. The Crossroads Classic just got even more interesting. Without any other storylines, Indiana-Butler games have a significant level of intrigue built into them. A matchup of two teams who could very realistically end up on the NCAA Tournament bubble brings significance from a resume perspective. The debut of Jordan Tucker and the mystery surrounding the kind of contribution he can make adds yet another layer of complexion. Now, the emotional and tactical impact of what Butler did offensively in this game turns an already fascinating showdown into a truly entertaining product. First and foremost, Butler’s been sluggish on offense the last three games. Having five players in double-figures and four make at least two 3-pointers means it’s not just one or two guys playing well heading in. Sean McDermott’s 23 points on 7-of-12 from three obviously stand out, but Joey Brunk also posted 15 points and made every shot he took. Kamar Baldwin knocking down 50 percent of his 3-pointers is a huge deal too. The Hoosiers have to look at this game and prepare knowing the Bulldogs are capable of putting on this kind of offensive display.